Implants? Crowns? Veneers? Invisible braces? As dental technology and services have expanded in the Bloomington area, so has the vocabulary. Dentistry has advanced to provide many new solutions that address almost every possible dental issue. In the past, if a patient in Bloomington had a missing tooth or a severely damaged tooth, Indiana dentists regularly suggested dental bridges or dentures, because they were the best options at the time. 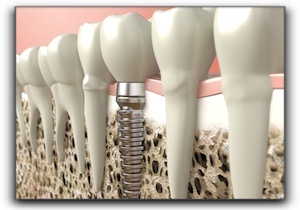 These days, the innovative dental implant in Bloomington has proven to be superior to dental bridges for most patients. They can also replace dentures or anchor dentures for some patients. Seamless – Fabricated to have the same shape, size, and color of the original tooth, the implant will blend seamlessly with all the other teeth. If the original tooth had aesthetic troubles, these can often be corrected with the implant crown. Function – A dental implant in Bloomington functions like a natural tooth allowing for normal eating and speaking. If you are interested in a tooth implant or cosmetic dentistry, call Create A Smile, PC – Dr. Ken Moore at 812-332-1405 to schedule a tooth implant consultation. Dr. Moore practices in the greater Bloomington area from Create A Smile, PC – Dr. Ken Moore in Bloomington. Dr. Moore will perform an exam, take x-rays, and give you a consultation. If it is determined that you are a good candidate for the procedure, the process will begin.